It is 1859 in North Elba, NY, and John Brown is actively helping slaves escape to Canada via the Underground Railroad. His daughter, Sarah, has just learnt that she can’t have children after a recent bout of dysentery, and she is more determined than ever to help her father, using her artistic abilities to draw maps to show slaves the way to safety. In a parallel story, in the summer of 2014, Eden is emerging from a deep depression after unsuccessfully trying to conceive with her husband Jack. They have just moved into an old house in New Charleston, West Virginia, when Jack shows up with a puppy and hires Cleo, the chatty 10-year-old neighbor, to help care for the dog. Soon, Eden discovers an antique doll’s head hidden in the root cellar. Where does it come from? How did it end up there, and why is it missing its body? “A dog is not a child”. This sentence came to Sarah McCoy 4 years ago and developed over time into The Mapmaker’s Children. The contemporary characters Eden and Jack came to her first, then the author got interested in John Brown and his daughter. She decided to tell the story with chapters alternating between Sarah and Eden, two courageous and determined women linked by history and by the fact they can’t have children. 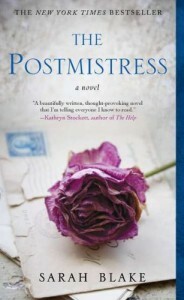 The book takes place in an interesting period of US history, right before and during the Civil War, and it is refreshing to see it through the eyes of 2 different women from very different times. Sarah Brown is based on the real-life daughter of John Brown. 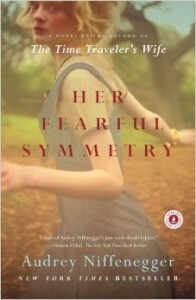 While naive at the beginning of the novel, she develops into a smart and independent woman. Eden is not a very likable character at first, as she seems very selfish and withdrawn. However, as the story unfolds, she emerges from the depression and anger of not being able to conceive. 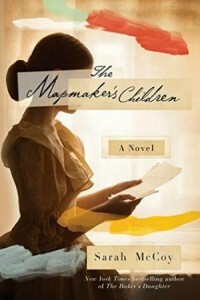 The Mapmaker’s Children is compelling, and the ending is satisfying and realistic. As always, I enjoyed the literary references made throughout the book to Louisa May Alcott, Henry David Thoreau, Hans Christian Andersen, and Mary Artemisia Lathbury. I only wish there was more information on the way the Underground Railroad operated, perhaps by further developing George and Freddy Hill’s characters (friends of the Browns). 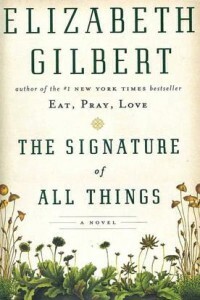 On the whole though, I thoroughly enjoyed this book. The Mapmaker’s Children was sent to me for free in exchange for an honest review. Sarah McCoy has never been really good at reading maps. She prefers using a GPS. Her father was in the army, so she moved a lot when she was a child. She even lived in Germany for a while. Her first novel, The Time It Snowed In Puerto Rico, is set in Puerto Rico because her mother was born there, and the author spent many vacations on the island. Like Cleo in The Mapmaker’s Children, Sarah McCoy likes to watch “Jeopardy”. 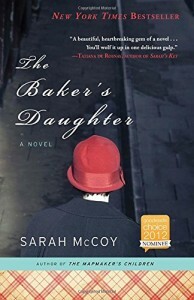 About the author and her work: Sarah McCoy’s Website.